Mosquitoes make it difficult to enjoy our warm Florida climate without experiencing bites that leave itchy, red welts. These bloodsucking pests are more than just a irritating nuisance, though — they’re carriers of the nasty pathogens responsible for serious illnesses like malaria, dengue fever, West Nile and Zika. Given that the range of such diseases is expanding, you need to use multiple methods to avoid mosquito bites. Cold-blooded mosquitoes prefer an environment that’s humid and about 80 degrees. Having an HVAC system that’s able to effectively dehumidify and cool your home can help make it inhospitable to mosquitoes. If any do decide to come inside, they’ll follow the trail of carbon dioxide from your exhaled breath to find their next meal. The flow of cool air from your HVAC system being circulated through the house disrupts a mosquito’s tracking ability and makes it harder to pinpoint your exact location. 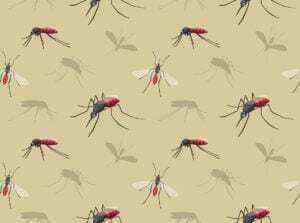 It’s the female mosquitoes that bite in search of a protein in human blood that aids in their egg development. Once she’s taken a drink, a mosquito looks for a spot where there’s standing water – such as a slow-moving condensate drain – and lays as many as 300 eggs. If you don’t want your condensate drainage system used as a baby mosquito incubator, check it for obstructions regularly, flush out any blockages as needed, and empty/clean the collection pan too. In places around the globe where the spread of malaria is unchecked, HVAC equipment with anti-mosquito technology is now available. Thanks to this kind of advancement, you may soon be able to invest in cooling equipment here at home that features ultrasonic mosquito repellant capabilities. Using sound waves that are safe for humans, these devices have been proven effective for eradicating annoying, disease-carrying mosquitoes. To learn more ways to use your HVAC system to make day-to-day life more comfortable in your Orlando-area home, contact us at Rinaldi’s Energy Solutions.